What do you do with a huge terra cotta pot that is cracked; cracks too large to hold anything major in the pot! Hmmmm...I also had numerous shards from other pots too! I have been a gardener all my life; more years than I want to admit. 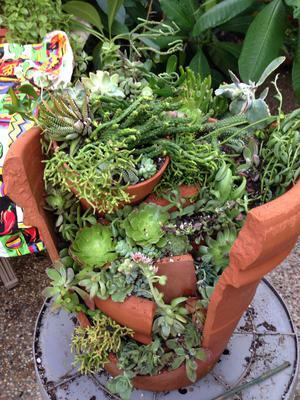 But I have had a recent interest in growing succulents, so the idea for my 'Broken Terra Cotta Succulent Pot Project' was born. I traded some plant cuttings I had been rooting here south of Houston, Texas with another gardener who had succulent cuttings in California. She sent me a large box full of cuttings, I had read about letting them 'harden off', and I was ready. This evening I completed my project, I hope you like it. I do, even though I don't know the names of any of the plants I used. Your pot is gorgeous, Mary. In this case, it doesn't even matter what the names of the plants are, just that they're happy and healthy. You can be proud of this one! Join in and write your own page! It's easy to do. How? Simply click here to return to Best Succulent Container Contest 2016.